Dulaney coach Chad Boyle was not romanticizing when he said the Glory Days Invitational flew under the radar as a top cross country meet. [button-red url=”http://va.milesplit.com/meets/212167/results#.Vh0zOvlVhBf” target=”_self” position=”left”] Results [/button-red]The girls varsity race was a near-complete all-star collection, with Virginia 4A (and national) title threat Weini Kelati burning the field early and leaving Pan Am Juniors 1,500 meter champion Kate Murphy, Virginia 5A defending champion Heather Holt and Taylor Knibb, the top private school runner in D.C. and Maryland last year, to sort the rest of the top spots. 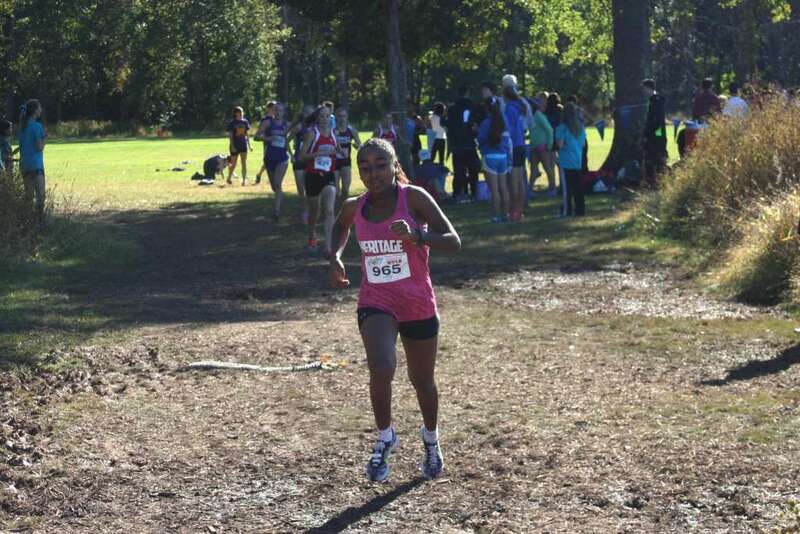 Kelati, a senior at Heritage, finished in 17:11, 26 seconds ahead of Lake Braddock junior Murphy. Murphy is easing into her season after racing on the track in early August, and was suffering from a cold, which convinced her to back off and let Kelati go. She still shed George Marshall sophomore Holt in the second half. Holt tried to stick with Murphy after getting out a little fast in the first half mile. Holt finished in 18:12. Last year, after a week of heavy rain preceded a morning storm when the Marshall team was getting on the bus, coach Darrell General called off the trip to the soaking wet course. Knibb won the varsity B race last year, running 19:10 compared to this year’s 18:27. Like Murphy, she is also easing into her cross country season after concluding her triathlon racing season. She won the DCXC senior race on her first day back on the cross country team. Lake Braddock won the team title with 49 points over James Madison’s 78, with five Bruins in the top 21, with Sara Daniels (sixth) and Sonya Butseva (ninth) joining Murphy in the top 10. 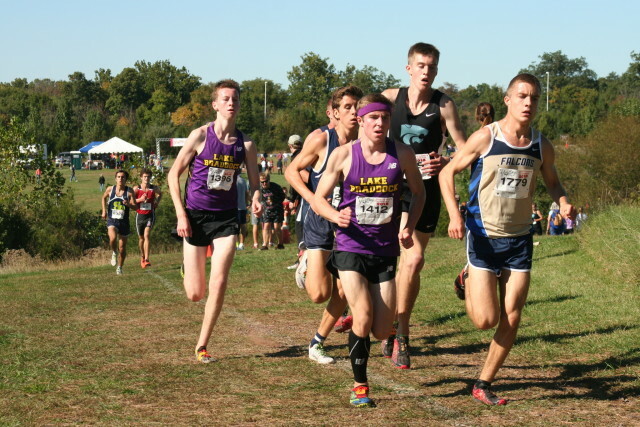 Lake Braddock’s boys were not as lucky, losing by a point to Boyle’s Dulaney team, which brought five of its top seven back from last year’s second place Maryland 4A team. Good Counsel finished in third, led by second place Jack Wavering, and Severna Park, last year’s Maryland 4A champion, was fourth. The week prior, Running Times ranked Severna Park and Dulaney second and third, respectively, in the southeast United States. Eric Walz kicked off scoring for Dulaney in third (15:59) with Elijah Hawkins in 10th (16:13) and Sean Smyth and Andrew King right behind him in 16:15. Tyler Cox–Philyaw, a Millbrook senior, came on top in 15:49, but it got close toward the end. Wavering has been racing well this season, with a third place finish at the Oatlands Invitational three weeks ago. Wavering ran 15:52 for a five-second margin over Walz and just three seconds behind Cox-Philyah. And Wavering was just that focused during the race. Centreville junior Dan Horoho kicked off a good day for the Centreville boys by finishing fourth in 16:05, an improvement in all ways over last year’s race, when he ran 17:18 for 56th. Senior Brent Bailey followed 10 seconds behind in 13th place.